Business Intelligence (BI) is a broad term that relates to applications that analyze data to understand and act on the key metrics that drive profitability in an enterprise. Key to analyzing that data is providing fast, easy access to it while delivering it in formats or tools that best fit the needs of the user. At the core of any BI solution are user query and reporting tools that provide intuitive access to data supporting a spectrum of users from executives to “power users,” from spreadsheet aficionados to the external Internet consumer. IBM® DB2® Web Query for i offers a set of modernized tools for a more robust, extensible, and productive reporting solution than the popular IBM Query for System i® tool (also known as IBM Query/400). IBM DB2 Web Query for i preserves investments in the reports that are developed with Query/400 by offering a choice of importing definitions into the new technology or continuing to run existing Query/400 reports as is. But, it also offers significant productivity and performance enhancements by leveraging the latest in DB2 for i query optimization technology. The DB2 Web Query for i product is a web-based query and report writing product that offers enhanced capabilities over the IBM Query for iSeries product (also commonly known as Query/400). IBM DB2 Web Query for i includes Query for iSeries technology to assist customers in their transition to DB2 Web Query. It offers a more modernized, Java based solution for a more robust, extensible, and productive reporting solution. Build reports with ease through the web-based, ribbon-like InfoAssist tool that leverages a common look and feel that can extend the number of personnel that can generate their own reports. Simplify the management of reports by significantly reducing the number of report definitions that are required through the use of parameter driven reports. Deliver data to users in many different formats, including directly into spreadsheets, or in boardroom-quality PDF format, or viewed from the browser in HTML. Leverage advanced reporting functions, such as matrix reporting, ranking, color coding, drill-down, and font customization to enhance the visualization of DB2 data. DB2 Web Query offers features to import Query/400 definitions and enhance their look and functions. By using it, you can add OLAP-like slicing and dicing to the reports or view reports in disconnected mode for users on the go. 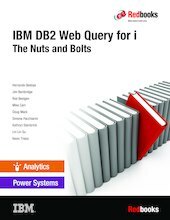 This IBM Redbooks® publication provides a broad understanding of what can be done with the DB2 Web Query product. This publication is a companion of DB2 Web Query Tutorials, SG24-8378, which has a group of self-explanatory tutorials to help you get up to speed quickly. IBM DB2 Web Query for i - New Materials!